‘Organ is not a dirty word’ takes us to Barry Morgan’s World of Organs – a kitschy music shop located in Sunnyside Mall. Here we learn of Morgan’s rivalry with a childhood acquaintance who has opened up a store next door selling electronic pianos. 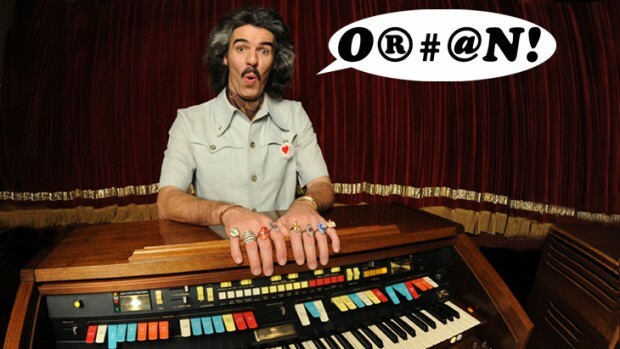 Barry Morgan is a great character and watching him at the organ is a joy. The constant grinning, the safari suit, the fabulous hair – for all his over-the-topness, Morgan feels like a fully realized character. Getting to hear about his relationship with his deceased Mum Nancy was a nice addition. Her words of wisdom dotted throughout the evening were always funny and at times, oddly touching. The show did feel a little long in parts, though this is perhaps because the humor got a bit ‘Are You Being Served?’ for my tastes. Despite the title, ‘organ’ can indeed by a dirty word, and this was a concept that was made very clear repeatedly. ‘Organ is not a dirty word’ has a pantomime feel to it. There are quite a few sections of audience participation, both as group yelling out of things and singling out individuals. However, while I found it a little overdone at times, the audience really seemed to get a kick out of it. Morgan’s comedic style certainly fits with the nostalgic vibe of the show. References to dial phones, Bex and ‘Pot of Gold’ would probably be lost on a younger audience, but they are still very present in Barry Morgan’s world. Entering his shop is a step back in time. The one place where the present day occasionally creeps through is the music. In amongst the classics, Morgan chucks in a little ‘Black Eyed Peas’ and other more contemporary acts for the kids. The clash between the melodies of these tracks that you’d usually hear blasting over the PA in a store and the gorgeous sound of Morgan’s Aurora organ was fantastic. The camera Morgan set up to look over the keyboard was a wonderful touch. It’s amazing to watch Morgan at work on the keys and see just how complicated the organ operation is. Not particularly funny, sure, but fascinating. ‘Organ is not a dirty word’ is a great peek into the world of Barry Morgan and a delightful snapshot into the past. It’s worth checking out if you’d like a healthy dose of nostalgia. Barry Morgan – Organ is not a dirty word is showing at the New Ballroom at Trades Hall until April 21.